Is Macintosh HD full to the brim? Wonder what is using up all that space? With HoudahSpot, it is easy to find the culprits: large files that were recently added to your Mac. If disk space is running tight, you may want to delete or compress these files, or move them to an external disk. The following search criteria will match files larger than 100 MB. The search is restricted to files added (e.g. installed, or downloaded), created or modified within the past month. Start the search for HoudahSpot to list files. 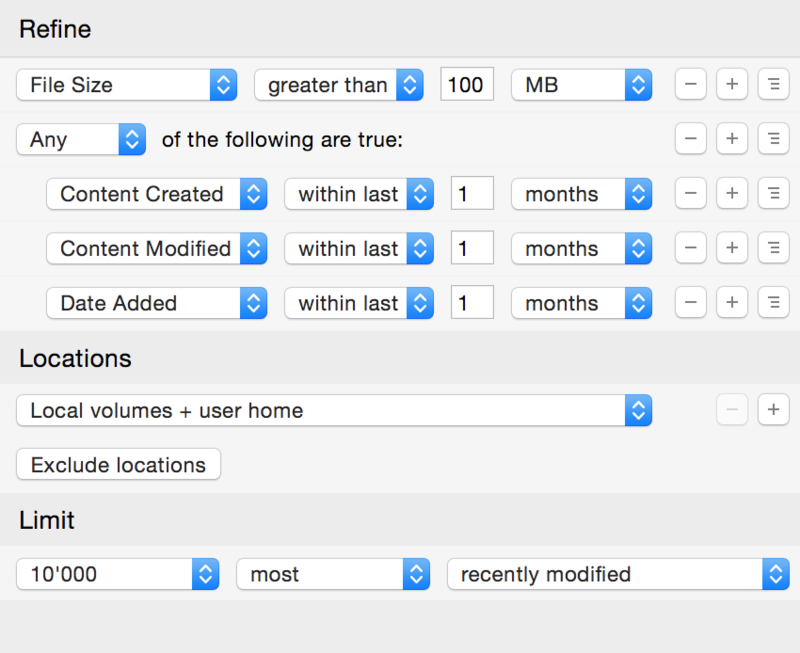 You will want to enable the “File Size” column to see how much space each of the files is using up. Click the column header to sort by file size and see the largest files listed first. Download the pre-configured HoudahSpot search. The above search will, however, not work for finding large folders: the file size of folders is always zero rather than the sum of all files. You can still use HoudahSpot to find recently changed folders and check folder sizes. Search for folders created, modified or added within the past month. Have HoudahSpot display the “Total Size” column. HoudahSpot will compute the total size of each folder. Click the column header twice to sort results so that the largest folders are listed first.